If you had to pick the best-looking automotive blog on the web, it would be www.chromjuwelen.com, hands down. Dig just a touch deeper and you’ll find that beauty is more than skin deep. I am excited to announce that NeedThatCar will now be adding its unique touches to their great site. Chromjuwelen is loaded with a ton of information about all things automotive from all parts of the world. By partnering with blogs from the world over, they offer a veritable automotive smorgasbord. They also have excellent original content, including artfully shot videos covering topics from Viva Las Vegas to hot rod meets in Finland. These Germans aren’t just grabbing info and assembling it on a sweet website, they are also up to their eyeballs in autokultur as well. Ralf Becker, the Editor-In-Chief, drives a killer 1972 Pontiac LeMans with a 7M-GTE Toyota Supra engine. At the time of this writing, our post about the Blastolene Decoliner is featured on the front page, right side, under “Editor’s Picks”. 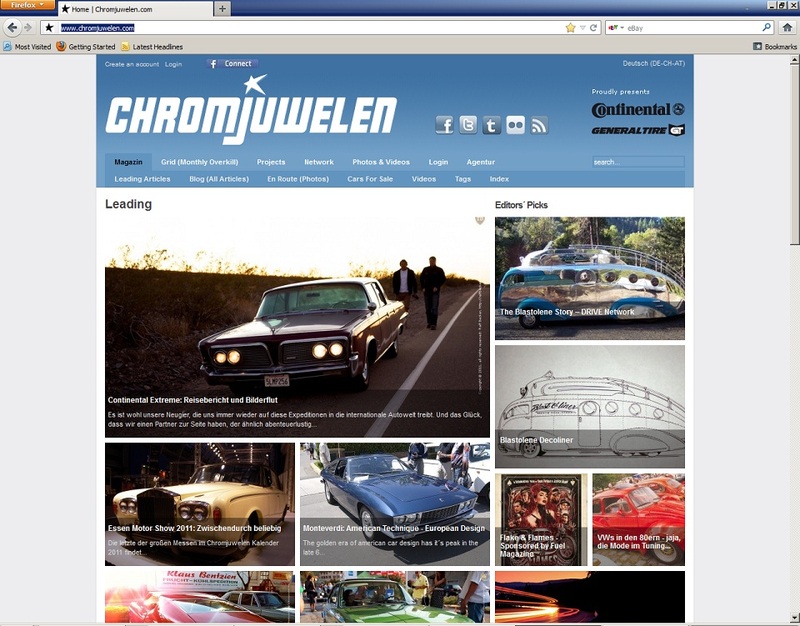 Check out their great website and, from NeedThatCar, willkommen to www.chromjuwelen.com! This entry was posted in chromjuwelen, Imports (Euro), Items of Interest (Not for sale), Sweet videos, Uncategorized. Bookmark the permalink. That’s awesome! Congrats on hitting the big time! We are proud to have you in our network.